other trim from a Hyde Park apartment. a set of three salvaged by my friend Zena. returns are indistinguishable from the original crowns. on the right now hosts a flat-screen TV. the girls sit is a large drawer. 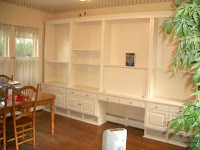 The client desired book shelves which would span the wall to accommodate his sprawling collection. But baseboard heaters also lined the wall, so we had to allow air passage at the bottom which we masked with grilles. We also ran electric behind the whole thing so a receptacle is available for a lamp or whatever at the center. A rolltop conceals a center desk area with pigeon holes for papers. 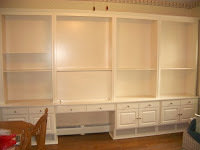 The flanking sections have lower cabinets, drawers, a fixed shelf and two adjustable shelves. 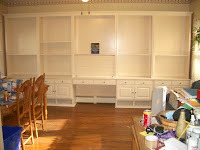 millwork and some I produced, like the dentil.